Hi everyone! I’m Barbara from Chase the Star, I’m so excited to be here sharing my latest holiday project with you! I love traditional wreaths at Christmas time, but sometimes it’s nice to think ‘outside the box’ and get a little creative. This year I made a wreath using what I had on hand in my craft closet, and in my pantry! Spray paint your twine wreath in silver or white, and let it dry. Sit in a comfortable chair and start gluing! This is where you can get creative! Make a fun pattern or just glue the candies in random spots. The twine makes it difficult to be too neat, so don’t worry about that and have fun! I suggest adding the candies to the front of the wreath only, this will enable it to lie flat against a door or wall. This process goes fast, just make sure you have lots of glue sticks nearby! Don’t forget to leave a gap for your ribbon. Wrap the ribbon once around the empty space on the wreath. Next you can either create a bow or just let the wreath hang from it. Spray the entire piece with the Mod Podge spray (or any matte spray sealer). Lastly, hang it indoors, and high enough so the kids can’t reach it! A simple and sweet wreath you can whip up while watching your favorite holiday movie! What DIY projects are you working on this Christmas? It was an honor to be back here at Tatertots and Jello! For more easy DIY crafts, home decor tutorials, furniture DIY’s, recipes, and fun stuff, visit me over at Chase the Star! Also, keep up with my blog on Facebook, Twitter, Instagram, Pinterest, and Google+! 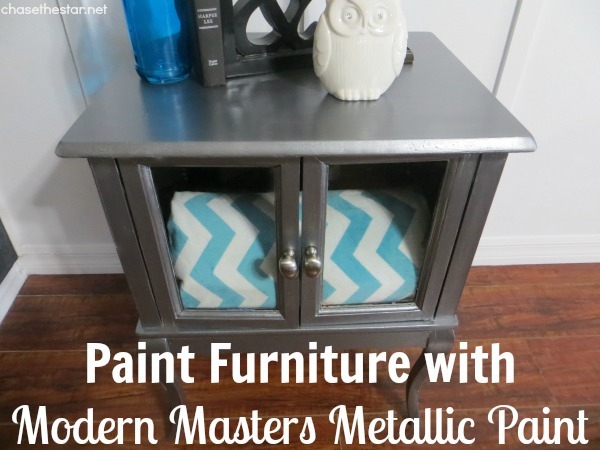 This side table got a more modern look when she Updated it with Metallic Paint. What a difference a little paint can make! 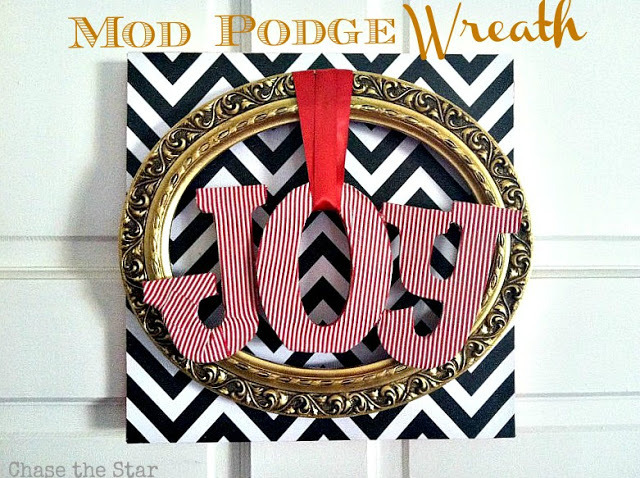 This Mod Podge Wreath is such a fun alternative to traditional wreaths! I just love the way she mixed and matched the patterns too! This gallery wall in her kitchen is just darling! 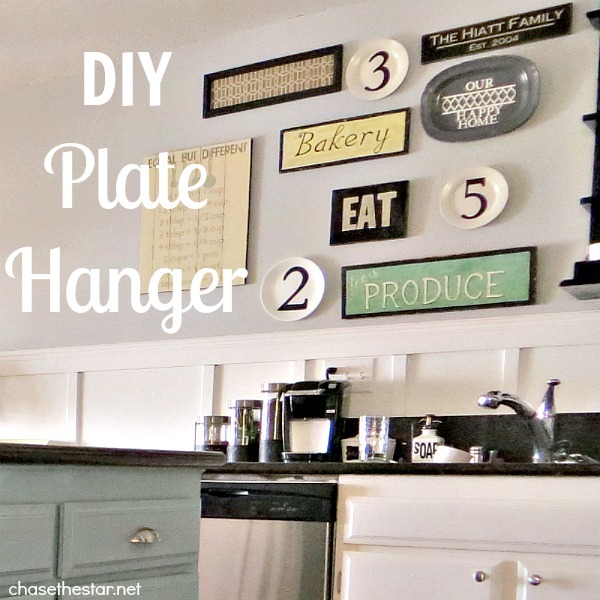 In this post, she shares how to make DIY Plate hangers! So simple, and easy! Love Your Christmas Wreath!! Here’s a Burlap Wreath Tutorial if you are looking for other ideas. LOVE this idea Barbara! I fear that if I made one some little hands might find their way to it and dig in :o) Pinning!! What a FUN idea!! I love it… I would totally eat it.. would be a bare wreath over here 🙂 Super cute! Such an adorable idea! I never thought of doing this. Love it! Such a cute DIY Christmas wreath! I had no idea it was candy & marshmallows until the instructions! LOVE it! what a GREAT idea! Love how easy it is. And it’s totally customizable.